Can’t make it to the big game? Well why not use this weekend as a great excuse to visit your favorite local businesses. Some of our favorite spots will be hosting a variety of events and offering great Super Bowl specials. 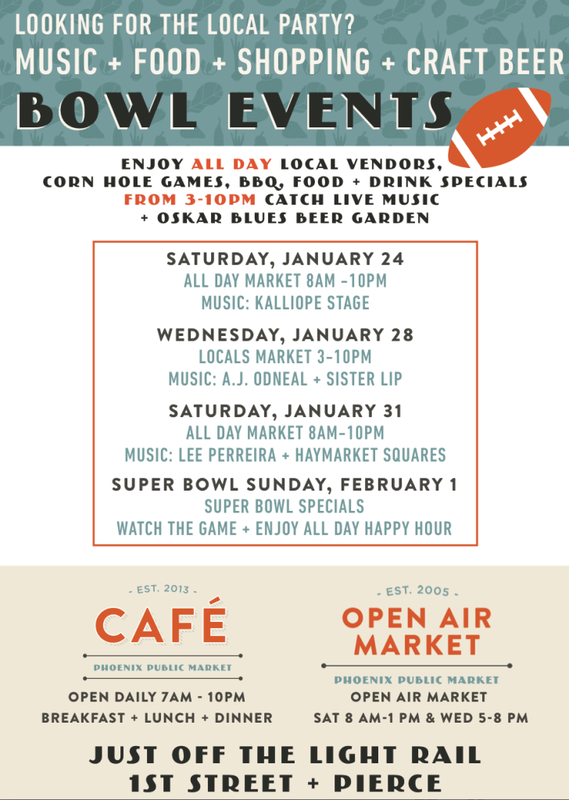 So celebrate the Super Bowl like a localist and checkout one of these local events this weekend. This weekend On the Edge Gallery in Scottsdale, AZ will be hosting an amazing event January 31st. As Super Bowl draws near you can stop by and enjoy beautiful artwork, live artist demonstrations, and a variety of refreshments. Besides the exciting activities On The Edge is offering a special promotion, for every $30 dollar gallery purchase On the Edge Artists will create you a custom license plate frame. Stop by this downtown favorite this weekend for two days of music, food, and football. The Phoenix Public Market’s open air market will feature more than a hundred of Phoenix’s local vendors. Enjoy food and drinks from 8:00am till 10 in the evening as Lee Perreira and Haymarket Squares perform live January 31st. The Public Market Cafe will also be offering a variety of specials on yummy goodness when you stop by to watch the game February 1st. This entry was posted in community and tagged Drink, Family, fashion, food, fun, local, music, Phoenix, superbowl. Bookmark the permalink.